CaF2(s) ↔ Ca2+(aq) + 2F−(aq). So, “natural” fluoride, CaF2, is good because the calcium present stops it getting into your blood stream. But “industrial” fluoride is bad because it has no calcium present to inhibit assimilation. True, the most commonly used fluoridating chemicals are fluorosilicic acid, sodium fluosilicate or sodium fluoride. These do not contain calcium. But wait a minute! These chemicals are drastically diluted in the water supply which already contains calcium from natural sources, and sometimes from water treatment chemicals like lime. Sauerheber sort of hints at this in his reference to “hard water.” Water “hardness” refers to its mineral content and is usually expressed as the calcium, or calcium carbonate, concentration. It is a common measure of water quality so data is readily available from water treatment plants. 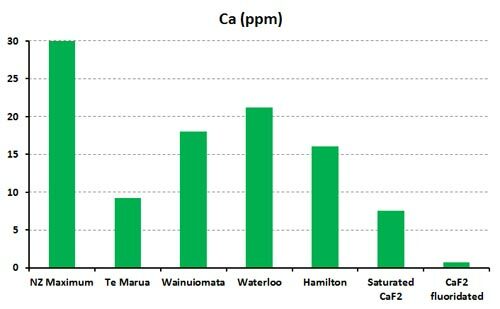 In the graph below I compare the calcium concentration from some typical New Zealand water treatment plants with the calcium concentration of a saturated CaF2 solution and the theoretical calcium concentration of “pure” water fluoridated with CaF2 to produce a fluoride concentration of 0.75 ppm (mg/L). The majority of NZ waters are considered “soft” with a hardness of 30 ppm (expressed as Ca) or less. I have used this for the NZ maximum. The Te Marua, Wainuiomata and Waterloo treatment plants are in the Wellington region. The Hamilton treatment plant is in Hamilton city. CaF2 is only slightly soluble so a saturated solution contains approximately 7.5 ppm Ca and 7.5 ppm F, depending on pH and temperature. 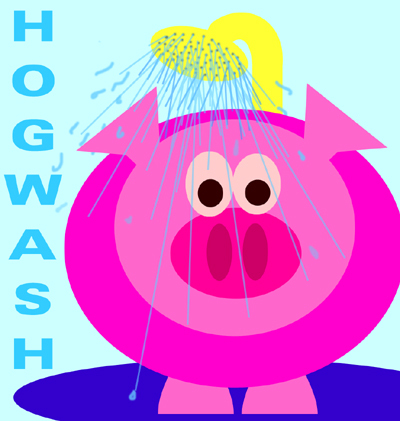 All this talk about “natural” CaF2 somehow being “safe” because it contains calcium, whereas the fluoridation chemicals used do not contain calcium, is hogwash There is plenty of calcium even in “soft” drinking water – far more calcium that could be derived from “natural” CaF2 if it were used to produce the optimum concntration fo fluoride used in community water fluoridation. At no point in article does the author give any evidence to support his claim that water with natural levels of calcium that has added sodium fluoride or fluorosilicic acid, etc, is safer than naturally occurring calcium fluoride. Something is fishy here. Why should it be any different? The low levels of Na added are small compared with natural levels. The natural Ca levels in drinking water are much higher than anything added as CaF2 at optimum levels.